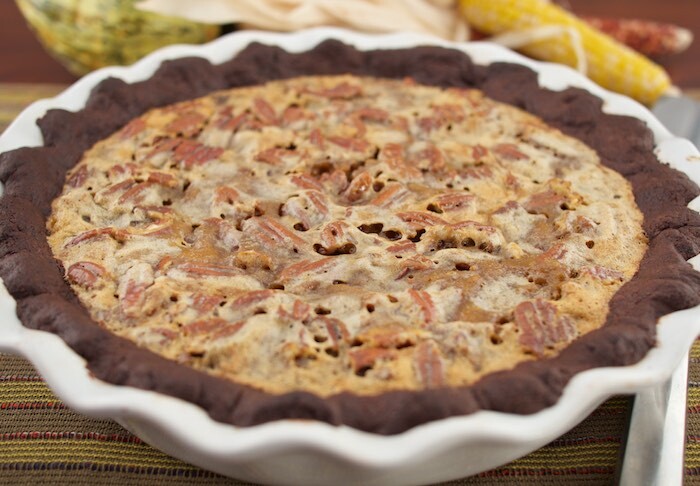 Food Hunter's Guide to Cuisine: All-In-One Chocolate Pumpkin Pecan Pie! All-In-One Chocolate Pumpkin Pecan Pie! The only thing better than having a pumpkin, pecan and chocolate pie on your holiday table is having one pie that combines all three. Which is exactly what I made for the Kerrygold & King Arthur flour November pie challenge. I took my favorite three holiday pie flavors and made them into one decadent dessert. I topped a chocolate crust with a creamy pumpkin pie and a layer of sticky praline like pecans. The result was out of this world delicious. The idea of combing these three desserts has been on my mind for some time now and I'm glad this challenge finally gave me an excuse to make it a reality. There's no longer a need to make three separate pies to please your holiday guests. This one dessert does it all. In a medium bowl, whisk together the flour, cocoa powder, almond flour, baking powder, and salt and set aside. In an electric mixer fitted with the paddle attachment, cream the butter and sugar on medium speed until lift and fluffy, about 1 minute. Beat in the egg and vanilla and scrape down the sides of the bowl. Beat in the dry ingredients just enough to form a soft dough. Scrape the dough not a large sheet of plastic wrap, press it into a disk, and wrap it tightly. Chill the dough until it is firm enough to roll, at least 2 hours or overnight. Preheat the oven to 450 degrees F. Grease and flour a 10 inch pie plate. Put all the ingredients in a food processor and pulse and process, scraping down the sides of the bowl as needed, for 2 minutes. Leave the filling in the processor for the moment. In a medium bowl, whisk all of the ingredients except the pecans together until smooth. Add Pecans. Roll out chocolate crust and place in prepared pie plate. Pour the pumpkin filling into the prepared pie crust. Top evenly with the pecan mixture. Spread the pecans as evenly as possible. Bake the pie for 15 minutes. Reduce the oven temperature to 300 degrees and bake for another 45 to 50 minutes, or until it is set and a thin knife inserted into the center comes out clean. Transfer the pie to a cooling rack. Oh man! All my favorite things in one pie! Both of my favorite Thanksgiving pies in one! I love it! Chocolate, pecan, pumpkin...who could you go wrong? This looks delicious!! All-in-one, that's awesome, no need to make or buy individual pies! 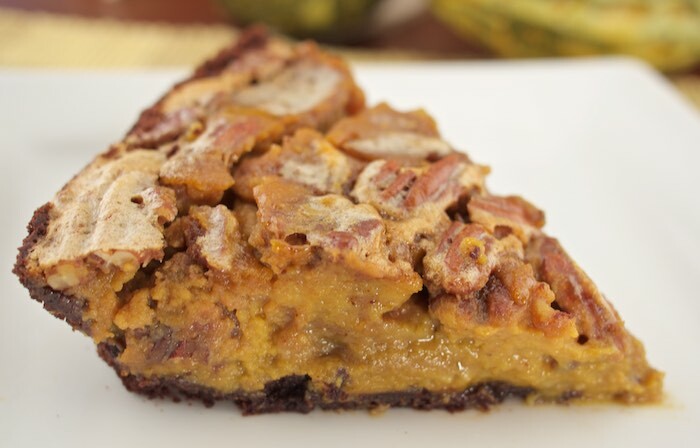 Ok, I've had chocolate pecan pie but whoa, adding pumpkin is genius! Great idea on using the chocolate crust too! Very clever. Why make 3 pies when you can make one? Who am I kidding? I always want 3 pies. But there is nothing stopping me from making 3 of these! Don't you just love it when you decide to go crazy and throw ingredients & flavors together and it works?? Brilliant move to combine all three pie flavors into one! Who's got the time to make 3 separate pies anyway?!?! A delicious Holiday Pie - the flavors of fall all in one delicious dessert. Now that might actually get me to enjoy pumpkin pie ; ) Looks delicious. This is sheer perfection for the holidays. I have some family members who would go crazy for this pie. Aren't you smart! Everyone's favorites combined into one - what a fab idea! I love pecan pie but have never had it with chocolate. I have a feeling I would LOVE it! Oh, my gosh! Now I can just have one slice since you've combined 3 of my favorites!!! This pie ticks all my boxes, delish! Such a surprising, yet awesome, combination. I too have finally come around to using quality butters and see that it does make a difference! Whoa!!! This is so much fun :) I'm sure everyone would love this at Thanksgiving. You're a genius! I love this idea. This is my kind of pie. Yummy! Yes - I want more chocolate in my pie. Waaannnntt!